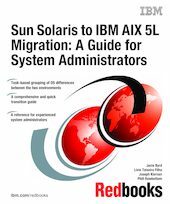 The aim of this IBM Redbooks publication is to provide a technical reference for IT system administrators in organizations that are considering a migration from Sun Solaris to IBM AIX 5L-based systems. This book presents a system administrator view of the technical differences that exist and the methods that are necessary to complete a successful migration to AIX 5L-based systems. This book is designed primarily as a reference for experienced Sun Solaris 8 or 9 system administrators who will be working with AIX 5L. This book is not an AIX 5L administration how-to book for system administrators who are beginners, but rather a guide for experienced administrators who have to translate a given Solaris system administration task to AIX 5L.